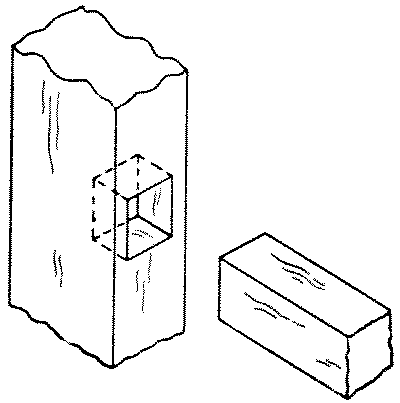 The tenon in its simplest form is made by dividing the end of a piece of wood into three parts and cutting out rectangular pieces on both sides of the part left in the middle. The mortise is the rectangular hole cut to receive the tenon and is made slightly deeper than the tenon is long. 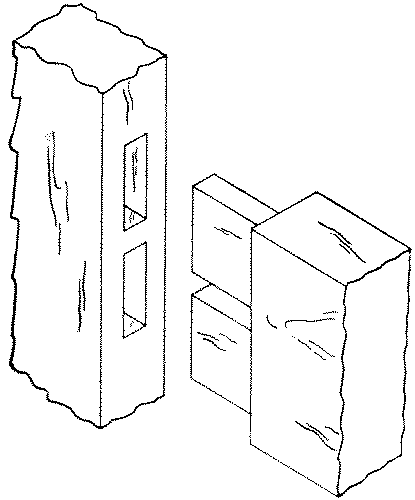 The sides of the tenon and of the mortise are called “cheeks” and the “shoulders” of the tenon are the parts abutting against the mortised piece. No. 30. 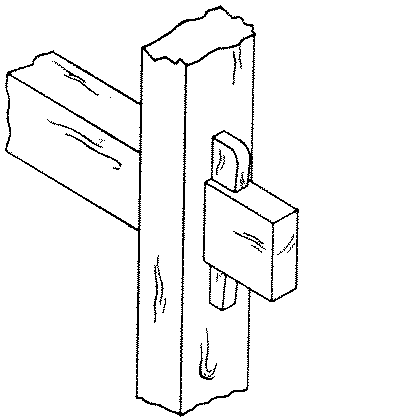 A stub mortise-and-tenon is made by cutting only two sides of the tenon beam. It was formerly used for lower ends of studding or other upright pieces to prevent lateral motion. No. 31. 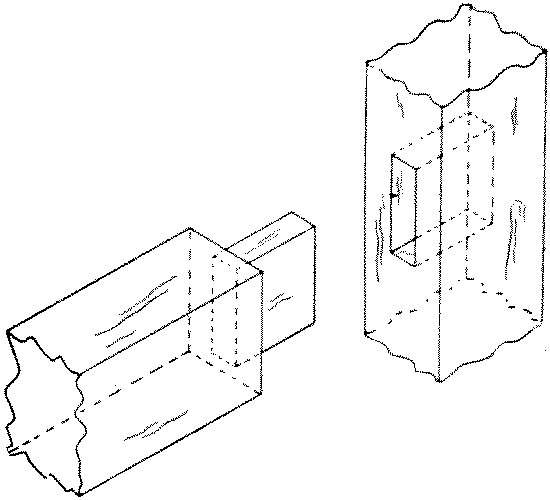 A thru mortise-and-tenon is made by cutting the mortise clear thru one member and by cutting the depth of the tenon equal to or more than the thickness of the mortised member. 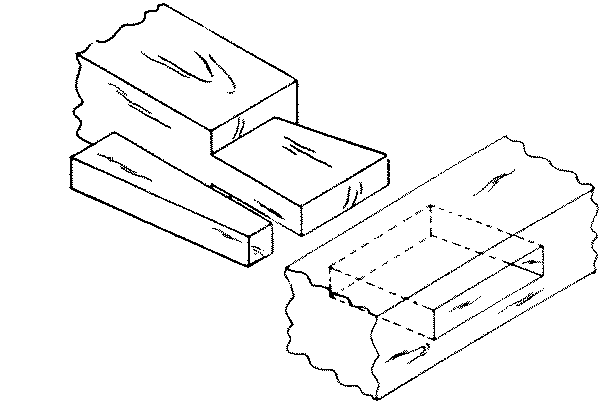 The cheeks of the tenon may be cut on two or four sides. It is used in window sashes. 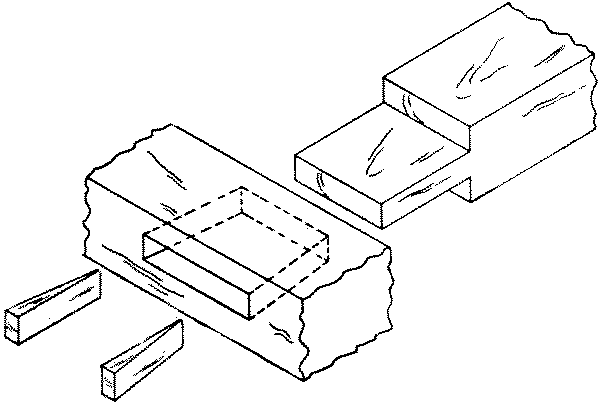 A thru mortise-and-tenon joint is made in the same way as a blind mortise-and-tenon (see below), except that the mortise is laid out on the two opposite surfaces, and the boring and cutting are done from both, cutting first from one side and then from the other. No. 32. 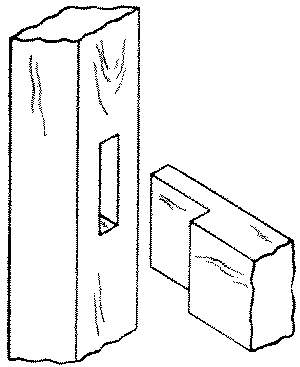 A blind mortise-and-tenon is similar to the simple mortise-and-tenon described in 30. 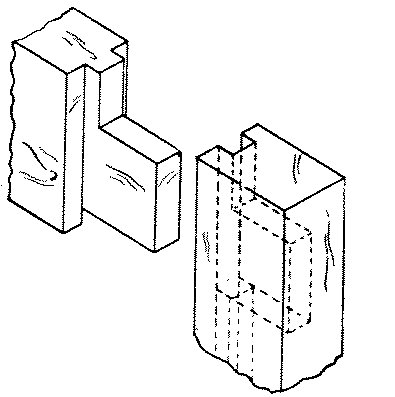 The tenon does not extend thru the mortised member and the cheeks of the tenon may be cut on two or four sides. 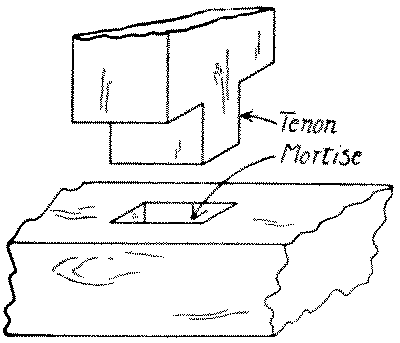 To make a blind mortise-and-tenon, first make the tenon thus: Locate accurately with a knife point the shoulders of the tenon and square entirely around the piece. On the working edge near the end mark the thickness of the tenon. Set the marking-gauge at the proper distance from the working face to one cheek of the tenon and gauge the end and the two edges between the end and the knife-lines. Reset the gauge to mark the thickness of the tenon and gauge that in the same way from the working face. Then mark and gauge the width of the tenon in the same way. Whenever there are several tenons of the same size to be cut, they should all be laid out together, that is the marking-gauge set once to mark all face cheeks and once to mark all back cheeks. If a mortise-gauge is available, use that. Always mark from the working face or working edge. Cut out a triangular groove on the waste side of the knife lines (at the shoulders) as in cutting a dado, Fig. 91. In cutting the tenon, first rip-saw just outside the gauged lines, then crosscut at the shoulder lines. Do all the rip-sawing before the crosscutting. If the pieces are small the back-saw may be used for all cuts. It is well to chamfer the arrises at the end of the tenon to insure its starting easily into the mortise. Locate the ends of the mortise and square lines across with a sharp pencil in order to avoid leaving knife marks on the finished piece. 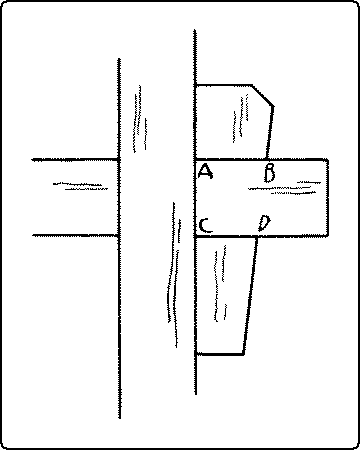 Then locate the sides of the mortise from the thickness of the tenon, already determined, and gage between the cross lines. As in the case of like tenons, if there are a number of mortises all alike, set the gauge only twice for them all. In cutting the mortice, first fasten the piece so that it will rest solid on the bench. This may be done either in a tail vise or by a handscrew, or by clamping the bench-hook firmly in the vise in such a way that the cleat of the bench-hook overhangs the piece. Then tap the bench-hook with a mallet and the piece will be found to be held tightly down on the bench. See Fig. 76. It is common to loosen up the wood by first boring a series of adjoining holes whose centers follow the center-line of the mortise and whose diameter is slightly less than the width of the mortise. Take care to bore perpendicularly to the surface, see Fig. 137, and no deeper than necessary. Dig out the portions of wood between the auger holes and chisel off thin slices, back to the gauge-lines and to the knife-lines, taking care all the time to keep the sides of the mortise perpendicular to the face. This may be tested by placing the chisel against the side of the mortise and standing alongside it a try-square with its head resting on the surface. Finally test the tenon in the mortise noting carefully where it pinches, if anywhere, and trim carefully. The tighter it fits without danger of splitting the mortised member, the stronger will be the joint. Many prefer to dig mortises without first boring holes. For this purpose a mortise-chisel, Fig. 68, is desirable. The method is to begin at the middle of the mortise, placing the chisel—which should be as wide as the mortise—at right angles to the grain of the wood. Chisel out a V shaped opening about as deep as the mortise, and then from this hole work back to each end, occasionally prying out the chips. Work with the flat side of the chisel toward the middle except the last cut or two at the ends of the mortise. No. 33. 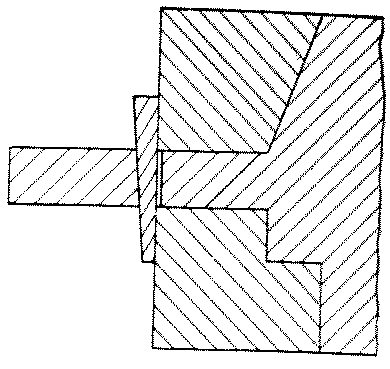 In a mortise-and-tenon joint on rabbeted pieces, Fig. 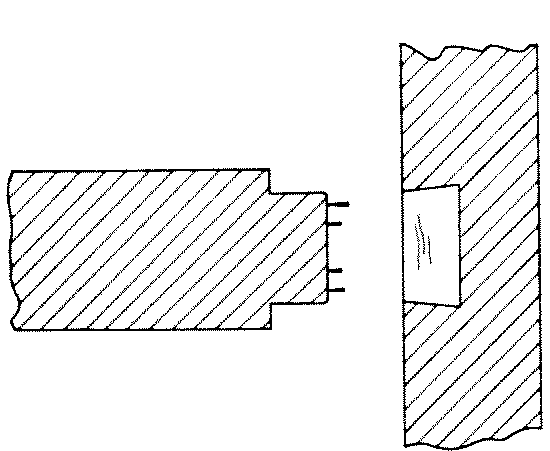 266, the tenon is as much shorter on one side than the other as the rabbet is wide. In Fig. 33, ab = cd. No. 34. 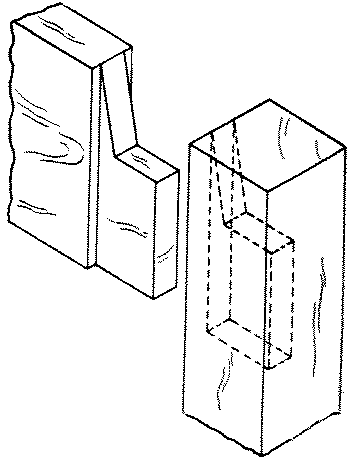 A wedged mortise-and-tenon joint is a thru joint in which after the tenon is driven home, wedges are driven in between the tenon and the sides of the mortise. The wedges are dipped in glue or white lead before being inserted. The sides of the mortise may be slightly dovetailed. It is used to keep a tenon tightly fixed as in wheel spokes. No. 35. A wedged mortise-and-tenon joint may also be made by driving the wedges into saw kerfs in the tenon instead of along its sides as in No. 34. It is used in ornamental joints as well as in carpentry. No. 36. A fox-tail tenon is a blind mortise-and-tenon in which the mortise is made slightly wider at the bottom than the width of the tenon. 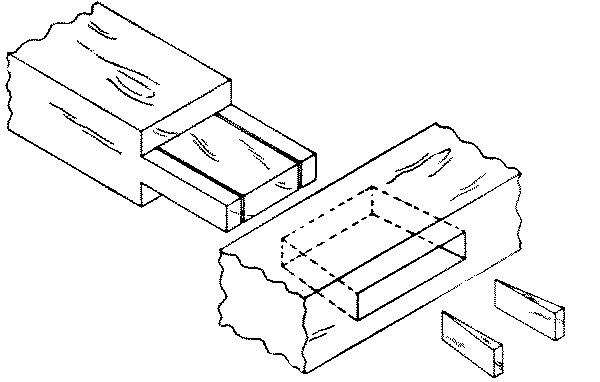 Wedges are driven into saw kerfs in the tenon before inserting into the mortise; then when it is driven home the wedges spread out the tenon and make it fill out the mortise. It is used in strong doors and also where the mortised member is already in place so that a wedged mortise-and-tenon is impossible. No. 37. A dovetail mortise-and-tenon is a thru mortise-and-tenon beveled on one side so as to form half a dovetail. The corresponding side of the mortise is also beveled and made wide enough so that when the tenon is pressed well up against its beveled side a wedge may be driven into the space left on the straight side. It is used to tenon a beam into a post especially where the post is fixed against a wall. It is also used in machinery frames which are made of wood. No. 38. A pinned mortise-and-tenon is one in which a pin is driven thru holes bored thru the mortised beam and thru the tenon to keep them from drawing apart. It is used in heavy framing as in bridges, in wagon-making, in window-sash, etc. No. 39. A keyed mortise-and-tenon is one in which the tenon protrudes thru the mortise far enough to receive a removable key and thus be drawn up tight to the mortised member. It is used in work-benches and in ornamental joints like knock-down bookcases and in other mission furniture. The keyed mortise-and-tenon is made as in a thru mortise-and-tenon, except that before cutting the tenons the holes for wedges should be laid out thus: measuring from the shoulder of the tenon, locate by superposition or measurement the outside of the mortised member. Deduct from this 1⁄16” and square a fine pencil-line across the face and opposite side. This line will be the inside of the hole for the wedge, and the 1⁄16” is deducted to make sure that the key wedges against the mortised member. On the upper surface of the tenon, lay off toward the end the width of the wedge at this point, A B, Fig. 252, and square across. On the under surface, lay off the width of the wedge at this point, C D, and square across. Fig. 252. Keyed Mortise-and-Tenon Joint. Gage the sides of the wedge hole on both upper and lower surfaces of the tenon. After cutting the mortise and tenon, bore and chisel out the hole for the wedge, taking care to cut the side toward the end on a bevel to fit the wedge. No. 40. A tusk tenon or shoulder tenon is one in which the tenon proper is quite thin but is reinforced by a thicker shoulder called a “tusk.” The upper shoulder is beveled. The object of this form is to weaken the mortised member as little as possible but at the same time to increase the strength of the tenon. It is used in joining tail beams to headers in floor framing. No. 41. 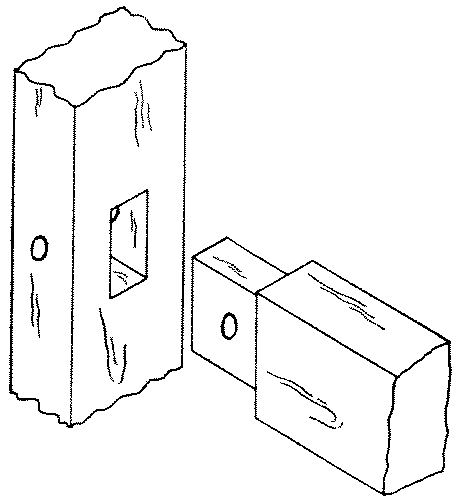 A double mortise-and-tenon consists of two tenons side by side in one piece fitting into two corresponding mortises. It is used in joinery, as in door-frames, but not in carpentry. No. 42. A haunched mortise-and-tenon is made by cutting away part of the tenon so that that part of it will be much shorter than the rest. The haunch gives the tenon great lateral strength and saves cutting so large a mortise hole. It is used in panel construction, as where the rails are joined to the stiles of doors. First plow the groove in all the members. This should be of the same width as the thickness of the tenons, which is ordinarily one-third of the thickness of the frame. The groove is approximately as deep as it is wide. Lay out and cut the tenon the width of the entire piece, minus, of course, the depth of the groove. The mortise should not come too near the end, or the portion of wood outside it will shear out. Hence the tenon is narrowed on the outside enough to insure strength in the mortised piece. The rule is that the tenon should be one-half the width of the rail, minus the groove. But enough of the tenon is left full width to fill up the groove at the outer end of the mortised piece. This is called the haunch. The width of the mortise is equal to the width of the groove, its length to the width of the tenon. Before assembling the panel frame, put soap or tallow on the corners of the panel to prevent its being glued to the frame. No. 43. Table or taper haunching. Sometimes, as in table construction, for the sake of stiffening the rail, or in places where it is desirable that the haunch does not show, the haunch is beveled from the tenon to the edge of the rail. No. 44. 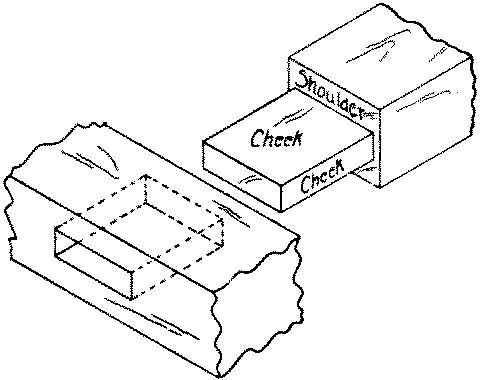 A bare-faced tenon is one in which a cheek is cut from only one side. It is used where the rail is thinner than the stile and it is desirable to keep the mortise near the middle of the stile. No. 45. A housed mortise-and-tenon is one in which the whole of the end of one member is let in for a short distance or “housed” into the other. It is common in grill work and in railings. No. 46. 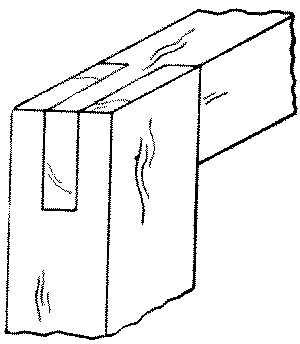 A slip-joint or end or open mortise-and-tenon is what would remain if a mortised member were sawn off along one side of the tenoned member. Window screens and other light frames such as those for slates and for printing photographs have this joint. 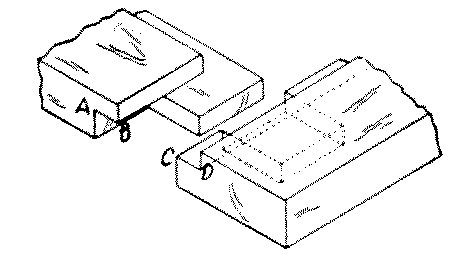 This joint multiplied is used for small machine-made boxes, and is then called corner locking.